Dirty Basement Blues: Mike Conley, Joe Stanley, Bryan Miller, Pate Zajicek,Frank Grimaldi. The band, which garnered a 2015 Detroit Music Awards nomination for best blues artist/group, doesn’t play straight blues. The band’s album “Coming Clean,” which received a Detroit Music Awards nomination as best blues recording, incorporates rock, soul and other influences. The album, which was recorded live with minimal overdubbing in March of 2014 at Josh Ford’s Sound Shop Studios in Macomb Township, has nine original songs and one cover, “Walk In My Shadow,” by Paul Rodgers. It features the vocals of Grimaldi, who is only 24 but delivers with depth reminiscent of white blues/rock/soul singers from Southeast Michigan who made their mark in the 1960s and ’70s, such as Mitch Ryder, Mark Farner of Grand Funk, Scott Morgan of The Rationals, and the late Rob Tyner of the MC5. Grimaldi, whose first public performance was singing a Led Zeppelin song during an 8th grade talent show, used to hear vocal comparisons with Robert Plant. Recently, fans have been telling him he sounds like the late Steve Marriott from Humble Pie fame. The group had its genesis as a power trio in early 2012 as two former Jam Samich band members — guitarist/vocalist Joe Stanley and drummer Mike Conley — joined forces with bassist Bryan “Bodi” Miller. A search for a lead singer brought in Grimaldi, who had been singing and playing guitar with the group Counter Culture. 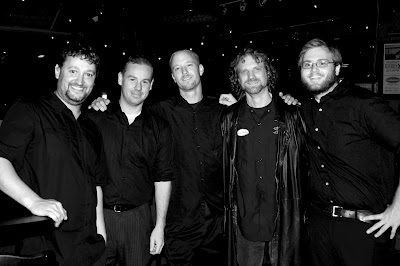 The band added keyboardist/vocalist Pete Zajicek from the Square Boys for the 2012 Detroit Blues Challenge and advanced to the final round, but could not compete in the finals because Stanley was on his honeymoon. Zajicek blended so well with the other musicians that he eventually joined the group as a band member. In 2013, Dirty Basement Blues returned to the competition and won the Blues Challenge, which is hosted by the Detroit Blues Society. Earlier, Jam Samich had advanced to the finals, but did not win. That made the victory a little sweeter for the group. From there, the band went to Memphis to compete in the International Blues Challenge. “Memphis was incredible,” Grimaldi said. “We stayed at the Weston, across the street from the Gibson factory. We were only a block from Beale Street. The members of Dirty Basement Blues are currently working on their second studio album and will also soon release “Dirty Basement Blues Live at Callahan’s,” a live album recorded at Callahan’s Music Hall in Auburn Hills, which will host a CD release party on Aug. 21. You can see the Oakland County-based Dirty Basement Blues band perform live from 5:30-6:15 p.m. on Thursday, June 25 at the Stars and Stripes Festival at Freedom Hill County Park in Sterling Heights; and 6-7:30 p.m. on Saturday, June 27 on the Summer Sun Stage at the first-ever Summer Magic Festival in Mount Clemens. Several other blues bands will be performing at the Summer Magic Festival. On the Summer Sun Stage (Clock Tower at New Street and Main Street), the Pet Zelenka Project performs classic rock and blues at 7:30 p.m. Thursday, June 25. On Friday, June 26, the schedule includes Rolling Blue (blues/rock) at 2:45 p.m. and Downriver Dan (blues/rock) at 5 p.m. On June 27, enjoy The Boa Constrictors at 2:15 p.m. On June 28, one man band Sweet Willie Tea performs a mix of Americana and blues at 1 p.m. and Laura Rain & the Caesars deliver powerful blues and soul music at 2:15 p.m.
On the Gemini Moon Stage (Roskopp Parking Lot, Macomb Place and southbound Gratiot Avenue), St. Cecelia (4 p.m.) and The Muggs (6:45 p.m.) perform blues rock on Friday. Saturday brings the Todd Wolfe Band (bluesadelic rock) at 7 p.m. and Jack Russell’s Great White (blues rock) at 10:30 p.m. Awesome! Thanks for the interview!